World renewable energy frontrunner Germany has set yet another new record for itself. Last Sunday, renewable energy, including wind, solar, hydro, and biomass, accounted for 74% of national demand during the middle of the day (when the sun was at its peak), Renew Economy has reported. When you consider that Germany is a heavily industrialised country (although it was Sunday) with a population of around 82 million people, this is no mean feat! Combined, the renewable energy output reached a massive 45.54 gigawatts between midday and 1:00pm. At the time, over 10 gigawatts of “conventional” (nuclear, coal, gas) power was also exported to neighbouring countries, because some baseload generators were unable to switch themselves off. As renewable energy capacity in Germany continues to increase, and the power grid is updated, this should become less and less of an issue over time. Even though a new record was set, solar output only accounted for 15.2 gigawatts of its possible peak capacity of over 33 gigawatts, as cloud and rain covered much of the north half of the nation. Wind power accounted for 21 gigwatts at the 1:00pm peak. This new record is a very good sign for the future. Renewable energy capacity is only going to increase from here. 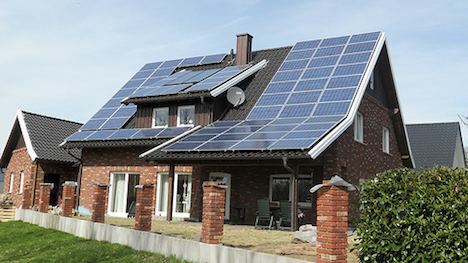 Image CC licensed by Tim Fuller: Rooftop solar installation in Germany.